Wed., June 20, 2018, 5:55 a.m.
Around the Northwest League and the Texas Rangers affiliates for Tuesday’s games. 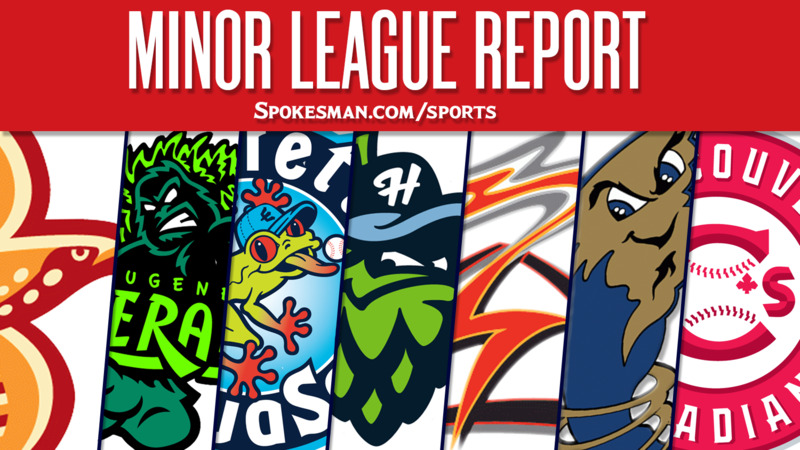 Spokane 8, Boise 4: Isaias Quiroz homered twice, including a three-run shot in the second inning, and the Indians (2-3) pounded the visiting Hawks (3-2). Curtis Terry went 3 for 4 with his third home run in as many days and Starling Joseph added a solo shot. Ryan Dease (1-0) went five innings and allowed two runs on seven hits with a walk and three strikeouts. Salem-Keizer 4, Tri-City 0: Four pitchers combined for a four-hit shutout and the Volcanoes (3-2) beat the visiting Dust Devils (2-3). Solomon Bates (1-0) struck out four over two innings and Diego Rincones drove in a pair. Vancouver 4, Eugene 1: Eric Silva (1-0) pitched five one-hit, shutout innings and the visiting Canadians (2-3) defeated the Emeralds (3-2). Christopher Bec went 2 for 3 and scored twice. Everett 7, Hillsboro 5: Connor Kopach went 3 for 3 with two RBIs and two runs and the AquaSox (2-3) topped the visiting Hops (3-2). Jansiel Rivera and Josh Stowers both homered for Everett. Fresno 5, Round Rock 3: Antonio Nunez drove in a pair and the visiting Grizzlies (44-27) downed the Express (30-41). Kyle Tucker went 3 for 4 with two runs. Frisco 4, Midland 3: Destin Hood went 3 for 4 with a run and an RBI and the visiting RoughRiders (25-46) edged the Rock Hounds (33-37). Michael De Leon went 3 for 5. Down East: The Wood Ducks were off due to the North vs. South All-Star Game break. Hickory: The Crawdads were off due to the North vs. South All-Star Game break. Isaih Kiner-Falafa went 3 for 3 with two doubles and a walk, a run and an RBI to help the Texas Rangers beat the Kansas City Royals 4-1. Published: June 20, 2018, 5:55 a.m.